Green Gate Village is located in the heart of downtown St. George and it is so festive right now! There are pumpkins everywhere for the Pumpkin Festival and I love it! There are activities for all ages during the Pumpkin Festival. 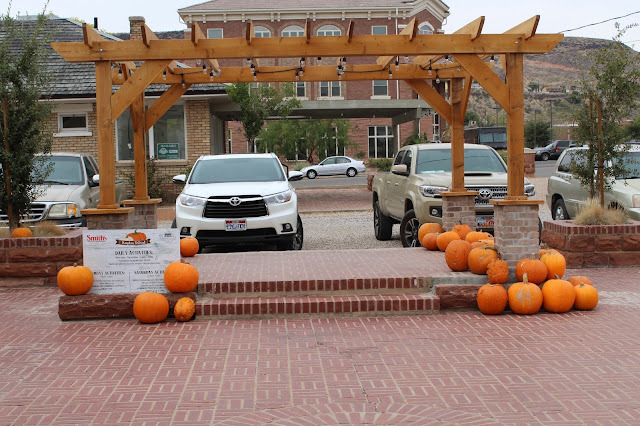 The Pumpkin Festival runs from October 14th - 28th. Keep reading to find out more! The activities happening daily (Monday - Saturday from 11 am - 7 pm) are the Pumpkin Scavenger Hunt and festival photo booth areas on all of the store porches in the village. The Pumpkin Scavenger Hunt is such a fun idea! This is something for the young and older. So how do you play? First, you need to go to Judd's General Store (located in Green Gate Village) to pick up your scavenger hunt sheet. The instructions are on the sheet but basically Witch Orpha has switched up all of the pumpkins! Eek! ;-) Your job is to match the historic Green Gate Village house with the correct pumpkin. There is a hint on the scavenger hunt sheet so make sure to read it closely! Can you figure out the hint just by looking at the pictures posted here?? As you can see the store porches are decorated so cute! Perfect photo op! So make sure you take advantage of that any time Monday - Saturday from 11 am - 7 pm. Just make note that the festival ends October 28th so you'll want to get it done before then!! So what else is happening during the festival besides photo booth areas and the scavenger hunt?? Mondays and Saturdays are the days you need to remember!! On Monday nights from 5 pm - 7 pm there will be spooky storytelling by Witch Orpha. There will also be face painting and a pumpkin decorating contest! And of course you'll also be able to take pictures on the store porches and do the scavenger hunt. You can drop off your decorated pumpkin to Green Gate Village Monday nights from 5 pm - 7 pm or Saturdays from 3 pm - 7 pm. The winner of the pumpkin decorating contest will be chosen on October 28th and there will be prizes worth over $800. Just a little secret between you and me - as of Wednesday there was only one entry so your chances are pretty good so far! It is a pretty cool entry! See Green Gate Village's Instagram account for a picture to see what you're up against! Each entry is $2 (get $1 off if you purchase your pumpkin from Smith's - just show your receipt). All proceeds will go to the victims of the Las Vegas shooting. So you get to help raise money for a good cause and each entry gets you a voucher for a free Wendy's Frosty. Awesome! 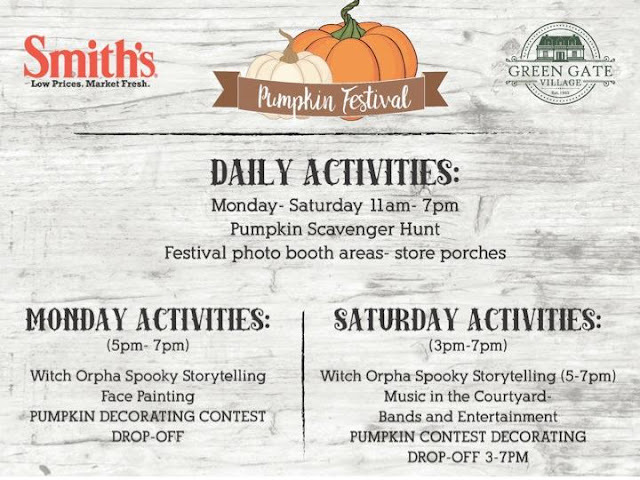 On Saturdays from 3 pm - 7 pm there will be spooky storytelling by Witch Orpha, the pumpkin decorating contest drop off, the scavenger hunt and photo opportunities on the store porches. PLUS from 5 pm - 7 pm there will be live music! That was a lot of information! But aren't you excited?? Here's a breakdown of everything. Hope to see you there! Spread the word! And make sure you follow Green Gate Village on social media so you don't miss any future events. This place is awesome and has some great projects in the works. This sounds so fun! I think we will definitely come listen to some music and take some pictures on Saturday!